Will Lower Rates Impact the Housing Market? 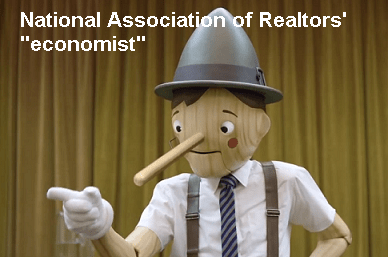 Economy is worse than policy makers admit publicly – Less than four months ago, the FOMC issued a policy statement that anticipated four rate hikes in 2019 with no mention of altering the balance sheet reduction program that was laid out at the beginning of the QT initiative. It seems incredible then that, after this past week’s FOMC meeting, that the Fed held interest rates unchanged, removed any expectation for any rate hikes in 2019, and stated that it might reduce its QT program if needed. After reducing its balance sheet less than 10%, the Fed left open the possibility of reversing course and increasing the size of the balance sheet – i.e. re-implementing “QE” money printing. Contrary to the official propaganda the economy must be in far worse shape than can be gleaned from the publicly available data if the Fed is willing to stop nudging rates higher a quarter of a point at a time and hint at the possibility of more money printing “if needed.” Remember, the Fed has access to much more detailed and accurate data than is made available to the public, including Wall Street. The Fed sees something in the numbers that sent them retreating abruptly and quickly from any attempt to tighten monetary policy. Housing market – As I suggested might happen after a bounce in the first three weeks of January, the weekly purchase mortgage index declined three weeks in a row, including a 5% gap-down in the latest week (data is lagged by 1 week). This is despite a decline in the 10-yr Treasury (NYSEARCA:IEF) rate to the lowest rate for the mortgage benchmark Treasury rate since January 2018. Not surprisingly, the NAR’s pending home sales index – released last Wednesday mid-morning for December – was down 2.2% vs November and tanked nearly 10% vs. December 2017. Pending sales are for existing home sales are based on contracts signed. This was the 12th straight month of year-over-year declines. Remarkably, the NAR chief “economist” would not attribute the decline to either China or the Government shutdown. He didn’t mention inventory either, which has soared in most major metro areas over the past couple of months. 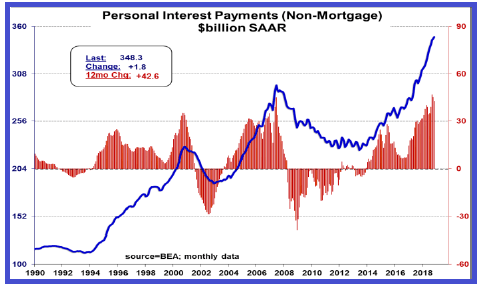 The chart above shows personal interest payments excluding mortgage debt. As you can see, the current non-mortgage personal interest burden is nearly 20% higher than it was just before the 2008 financial crisis. It’s roughly 75% higher than it was at the turn of the century. Fannie Mae raised the maximum DTI (debt-to-income ratio – percentage of monthly gross income that can be used for interest payments) to 50% in mid-2017 to qualify for a mortgage. This temporarily boosted home sales. That stimulus has now faded. And despite falling interest rates, the housing market continues to contract. That said, the Census Bureau finally released new home sales for November. It purports that new homes on a seasonally adjusted, annualized rate basis rose a whopping 16.9% from October. I just laughed when I saw the number. The calculus does not correlate either with home sales data reported by new homebuilders or with mortgage purchase applications during that time period (new home sales are based on contract signings). 90% of all new home buyers use a mortgage. The November number was a 7.7% decline from the November 2017 SAAR. According to the Census Bureau, the months’ supply of new homes is at 6, down from October’s 7 but up from November 2017’s 4.9. A perusal of homebuilder balance sheets would show inventories near all-time highs (homebuilders do not always list finished homes on MLS right away if a community already has plenty of inventory). The average sales price of a new home dropped to 8.4% from $395,000 in October to $362,000 in November. Anyone who purchased a new home with a less than 9% down payment mortgage during or prior to October is now underwater on the mortgage. Absent more direct Government subsidy and Fed stimulus, the housing market is going to continue contracting, with prices falling. Anyone who bought a home with less than a 10% down payment mortgage over the last 3-5 years will find themselves underwater on their mortgage. I expect home equity mortgage delinquencies and default to begin rising rapidly in the 2nd half of 2019.